The US is confident that North Korea was behind the Sony Pictures cyber-attack last year because the hackers "got sloppy", the FBI has said. The bureau's director James Comey said the group posted material from servers used exclusively by the North Koreans. November's attack on the company saw the leak of sensitive documents, and film The Interview briefly shelved. 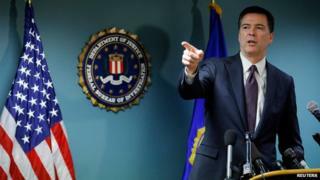 Cyber security experts have been sceptical about the FBI's assertion North Korea was to blame. After Sony's decision to temporarily cancel the film's release was described by US President Barack Obama as "a mistake", Sony later released the film in independent cinemas and also distributed it online. The comedy's plot revolves around a plan to assassinate North Korean leader Kim Jong-un. Pyongyang has denied being behind the cyber-attack, but described it as a "righteous deed". In retaliation, the US has placed sanctions on three North Korean organisations and 10 individuals. The sanctions are believed to be the first time the US has moved to punish any country for cyber-attacks on a US company. Mr Comey had been addressing delegates at the International Conference on Cyber Security in New York. He said there was evidence the hackers had used proxy servers in an attempt to disguise the attack's origins, but sometimes neglected to do so, revealing, the FBI believes, the true location. But experts remain unconvinced that the US has proved its case. "To be frank, director Comey has not revealed anything new," said Brian Honan, a security researcher. "Various IP addresses have been associated with this attack, from a hotel in Taiwan to IP addresses in Japan. "Any IP address connected to the internet can be compromised and used by attackers."